Shake Shack has a chance to be known for more than just burgers: It could also be a role model for the fast-food industry. The burger chain's motto is “Stand for Something Good.” And it has made a point of noting that it pays its entry-level workers more than the minimum wage -- a rarity in fast food. So as Shake Shack begins its journey as a public company on Friday, people will be watching to see if it can keep offering higher-than-average pay and good service, even as it grows into a global chain that answers to impatient stock investors. To be sure, there are some key differences between Shake Shack and mammoth chains such as McDonald's or Burger King. Its fare is more expensive. And most Shake Shacks in the U.S. are owned by the company, not by franchisees. But if Shake Shack can pay its workers decently even as it expands and still turn a profit, then it could set an example for an industry that staunchly resists demands to raise wages. A Shake Shack employee serves up burgers and fries at the Madison Square Park location. Going public may make that mission a bit more challenging. In low-wage industries such as fast food, it's much more common for private companies to invest in their workers than for public companies to do so, according to Zeynep Ton, a professor at MIT’s Sloan School of Management. Ton notes that there are a handful of public companies in low-wage sectors that still manage to pay above the industry average. Costco, the most famous example, is known for offering decent pay and a good benefits package to its rank-and-file workers, even as most of the retail industry keeps wages low. The warehouse chain has had to resist investor pressure to lower wages. Similarly, Shake Shack executives will have to fight the short-term temptation to cut costs and stick to their values “100 percent of the time” if they want to continue on their path as a feel-good burger joint, said Ton. Ton’s research shows that this strategy can pay off in the long run. Companies that invest in their workers with training and decent pay are more likely to have employees that are knowledgeable about products, answer customers’ questions well and drive sales. Shake Shack has been able to do that so far. The chain’s system-wide sales grew from $21 million in 2010 to $140 million in 2013, according to its IPO documents. But Shack Shack had just 63 stores at the end of that growth run, meaning it was relatively easy to keep tight control over the quality of food and service. Shake Shack ultimately plans to expand to 450 restaurants in the U.S. 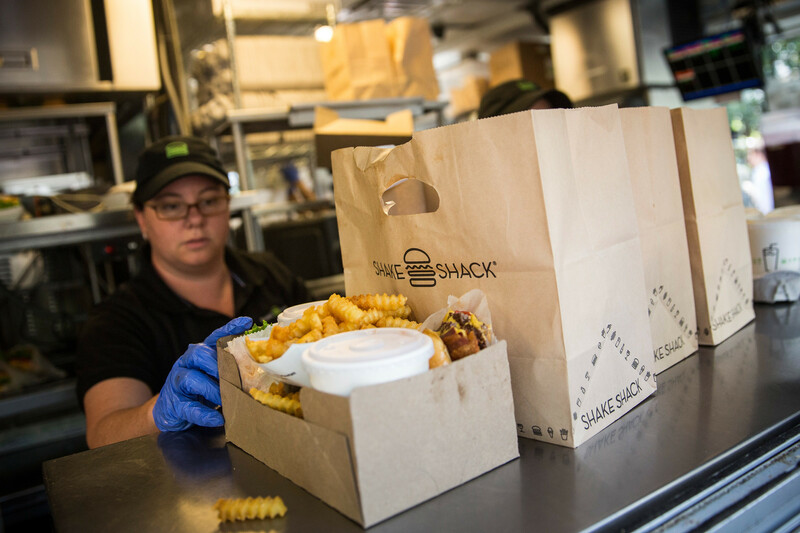 Shake Shack's history suggests it should be able to keep offering high-quality service even as it grows, according to Brian Darr, a managing director at Datassential, a food research firm. Shack Shack was founded by the Union Square Hospitality Group, which is known for its training programs -- the company even has a consulting arm for businesses looking to emulate its culture. Shake Shack founder and USHG CEO Danny Meyer wrote a book, Setting the Table: The Transforming Power of Hospitality in Business, arguing that companies that prioritize workers before guests and investors tend to be more successful.